Towards the end of the 18th century the beginnings of the Industrial Revolution meant that new ways of transporting raw materials and manufactured products were needed. The roads of the time, particularly in Wales, were very bad, and there were demands for a network of inland waterways like those already working in many parts of Europe. 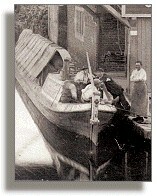 This led to the great age of canal building in Britain from around 1761 to 1816. Canals then played a vital part in the commercial transport of the first thirty years or so of the Victorian period, but they were to lose most of their trade with the coming of the steam railways around 1861.